Weapon Charge: US & allies to arm Libya rebels with 'Al-Qaeda links'? We start in Libya, where pro-government troops have pushed rebel forces out of several recently-captured territories after a heavy counter-offensive. This comes as some NATO countries, including the U.S. and France, are suggesting they could be open to arming the rebels. But there's criticism that this would go beyond the terms of the UN resolution. Kucinich "Critical Issue Today Is NOT Defense Of Libyan Democracy But Defense Of American Democracy! Peter Schiff: The Fed's Incompetency Must Stop! Alex talks with investment broker, author, financial commentator, and former Senate candidate from Connecticut, Peter Schiff. Alex Jones on RT: Al-Qaeda Works for The CIA! There is an increasing pressure from lawmakers in Washington, as well as from the American public for President Obama to be more specific in the strategy for Libya. Radio host Alex Jones however argues there is more to it than an American/Obama agenda. He compared the situation with the US missions in Iraq, Rwanda and Serbia, where, he alleged, Al-Qaeda was created by the CIA and used to fight Serbs all as a part of an overall globalist agenda of the New World Order. This time Max Keiser and co-host, Stacy Herbert, report on well-armed television presenters, bankrupt crusaders and a reign of terror in central banking. In the second half of the show, Max talks to Isa Blumi about Yemen, Libya and the militarization of borders. Ron Paul "It's Time The American People Woke Up!" Is war really nothing more than a profit machine driven by the industrial military complex? How do corporations control the government agencies such as the FDA, EPA, etc. In this series of free videos Field McConnel from Abel Danger discusses corporate influence on government agencies, the media, tv, law & people. Are corporations taking over the country and shifting the world toward globalization? How do corporations use lobbyist to team up and change the laws in USA. Field McConnell has served 4 terms of service to the U.S. military and Marines and has done significant research on the relationship between corporate entities, lobbyists, legislators, the mainstream media and more. The reasons behind the intervention in Libya are constantly being questioned. Critics say it's strange that Libya is being targeted, in particular, when there are several other violent uprisings in the Arab world. RT's Daniel Bushell reports on what else could be motivating western powers. Another strong earthquake off the coast of Japan has rocked the already devastated country. Although a Tsunami warning that was issued following the new quake has since been cancelled. The 9 magnitude earthquake and ensuing tsunami which struck the country 2 and a half weeks ago, ravaging whole regions, is now estimated to have killed well over 10 thousand. Workers are still battling to contain radiation leaks at a nuclear plant severely damaged by the disaster. Japan's nuclear agency says levels of radioactive iodine in the sea near the plant have risen to almost two thousand times the usual level. And as that crisis looms, many are still struggling with the loss of loved ones. As RT's Igor Ogorodnev reports, officials are being forced to come up with new ways to cope with the overwhelming number of dead. 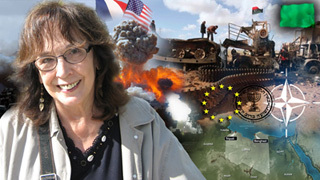 The war in Libya with political writer Diana Johnstone. She is the author of "Fools Crusade: Yugoslavia, NATO and Western Delusions". Recently, Diana has written two very revealing articles for counterpunch.org called "Libya another Kosovo - NATO and Coalition Bombs for Peace" and "Why are They Making War on Libya?" We try to answer the questions of who is behind the "coalition "forces and why have they decided to attack Libya now? We also detail some of the Sayanim and Zionist agents that have been involved in this process. We specifically talk about Bernard-Henri Lévy as being the leading voice influencing Sarkozy in France to take action against Gaddafi and Libya. Stay with us for a very revealing hour. --- RememberBuilding7 is a non-partisan effort led by 9/11 family members to raise awareness of the destruction of World Trade Center Building 7---. In this edition, Max Keiser interviews author and researcher Nicole 'Stoneleigh' Foss to debate on the Nuclear reactors' safety around the world. 100 to 300 thousand people are expected to take part in what's set to be the UK's biggest political demonstration for a decade. Mass protests are planned across the British capital to oppose the government's 80 billion pound spending cuts. The austerity measures are part of a treasury initiative to eliminate the country's huge budget deficit in just four years. Mike Adams, the Natural News Health Ranger, fills in for the second half of the show. Watson and Adams breakdown the ongoing nuclear crisis in Japan. Adams also interviews Kentucky Governor candidate, Phil Moffett, about his stance on the FDA. Christopher Busby: Fukushima 43 Mile Contamination Levels Twice as High as Chernoby! This week Max Keiser and co-host, Stacy Herbert, report on jail time for almost stealing an algorithm that could 'manipulate markets' and jail time for 'stealing' virtual gaming chips. In the second half of the show, Max talks to Ed Harrison about Japan, interest rates and war. Ron Paul Talks About Libya And The Constitution And President Run! Joel Skousen, political commentator non-fiction Survivalist author, and retreat consultant who specializes in preparedness topics, particularly survival retreat and fallout shelter design and construction, as well as in what he calls "strategic relocation." Toxic chemicals cause most of our modern health problems and chronic diseases. Some of these toxins include artificial sweeteners, flavor enhancers, trans fats, fluoride, dental amalgam fillings, etc. Please share this video playlist with your friends and family! Russia has joined the growing list of countries to impose a ban on Japanese food imports, as the country continues to struggle to cope with both a humanitarian crisis and the threat of a nuclear disaster. On Thursday, two workers at the Fukushima Daiichi nuclear power complex were taken to hospital after being exposed to radiation. A third worker who was exposed did not require hospitalisation. White smoke has been seen coming from four of the plant's six reactors, with national broadcaster NHK reporting that this is the first time reactor number one has emitted such smoke. Alex talks with retired CIA officer turned political activist, Ray McGovern. McGovern was a Federal employee under seven presidents over a period of 27 years, presenting the morning intelligence briefings at the White House for many of them. In February, during a speech by Secretary of State Hillary Clinton at at George Washington University, McGovern stood silently with his back turned during her remarks, leading to his arrest ana mistreatment at the hands of the police. Ray talks to Alex about the bombing of Libya. Alex covers other important news of the day and takes your calls. Webster Tarpley & Alex Jones: Libyan Assault/Invasion Planned Months Ahead! Der Spiegel magazine known for its depth of journalism has released astonishing pictures of the US soldiers but they haven't reached the public yet. Work to restore power and crucial cooling functions resumed Tuesday morning at the crisis-hit reactors at the quake-stricken Fukushima Daiichi nuclear power plant, following suspension Monday after smoke was detected at its No. 2 and No. 3 reactors, its operator said. Meanwhile, radiation 1,600 times higher than normal levels has been detected in an area about 20 kilometers from the crippled Fukushima Daiichi nuclear power plant, IAEA said. Alex talks with Washington, D.C.-based investigative journalist, author and columnist specializing in intelligence and international affairs, Wayne Madsen. He publishes the Wayne Madsen Report. Madsen will talk with Alex about photographs of American soldiers posing with bloodied and partially-naked Afghan bodies they had killed. Alex also covers the latest on the stricken Japanese nuclear plants and the radiation threat and the unfolding drama in Libya as the U.S. and its coalition attack the country. Ron Paul: We Tried Last Week To Bring Our Troops Home From Afghanistan & Now We're In Another War! This week Max Keiser and co-host, Stacy Herbert, report on the bright side of inflation and nuclear meltdown and examine Saif al Islam Gaddafis allegations that President Sarkozy owes him money. In the second half of the show, Max talks to Business Insider's Joe Weisenthal about being a paper bug for dollars, yen and central banking. Riz Khan - Attacking the US middle class? Politician and activist Ralph Nader examines the future of organised labour in the US. The U.S., Britain and France claim they have succeeded in scattering and isolating Muammar Gaddafi's forces after a weekend of air strikes. The coalition says they have no information to confirm if 64 people were killed during the bombardment. On Sunday night, Colonel Gaddafi's command centre in Tripoli was destroyed during a targeted attack. In this episode, Max Keiser discusses the global revolutions and focuses on the revolutions sweeping the Arab world with Gonzalo Lira from Chile. Debate: Is US Nuclear Power Safe? Is The US Nuclear Regulatory Commission and the nuclear industry prepared to deal with disaster? A multi-national force has launched a series of strikes against colonel Gaddafi's forces in Libya. It's all part of an operation to enforce a no-fly zone backed by the UN. Speaking from Brazil, U.S. President Barack Obama says it was 'clear' that allied forces had to protect civilians in Libya. RT gets more from RT's Gayane Chichakyan who's in Washington DC. MASS U.S. NAVY EVACUATIONS OUT OF JAPAN! Dr. Nick Begich: Fukushima Fallout is Worse Than What The Media is Telling Us! Alex welcomes back to the show Dr. Nick Begich, author of Angels Don't Play This HAARP: Advances in Tesla Technology. Begich has published articles on science, politics and education and is a well known lecturer, having presented throughout the United States and in nineteen countries. He spoken on various issues for groups representing citizen concerns, statesmen and elected officials, scientists and others. Earthquake forcaster Jim Berkland warns of a 'high risk'seismic window and potential for a massive quake poised to strike somewhere in North America in between the dates of March 19th and 26th. Berkland points to the recent mass fish die-off at King Harbor near Redondo Beach as a harbringer of a potential catastrophic quake in the near future. The fate of millions of Japanese now lies in the hands of just a few dozen. They're known as the 'faceless fifty' - a team of workers putting their lives on the line to stop nuclear disaster at the Fukushima plant. RT's Irina Galushko looks at how man sometimes has to sacrifice himself when technology fails. Also RT talks to Dr Kiyul Chung, he's a political scientist and Editor-in-Chief of political magazine 4th Media. Alex Jones on RT: Pentagon Preparing for Marshall Law!! State budgets are broke, the federal government is mired in conflict and partisan divide and people all over the country are taking to the streets. Is the system itself collapsing? Alex Jones says the US Empire must go down or we all go down with it, we don't have a choice, choose sides, it is either us or them we're at historic crossroads right now. This week Max Keiser and co-host, Stacy Herbert, report on the rathole to the Walker palace and a secret silver investor. In the second half of the show, Max talks to media historian and critical theorist, Michael Betancourt, about agnotologic capitalism and the aura of the digital. Libya Strike: Air warfare hours away? France and the UK have declared that a military operation against Libyan leader Muammar Gaddafi's regime will start within hours. The warning comes after the UN Security Council backed a no-fly zone over Libya. Paula Slier is in Tripoli for RT. Paul Laviolette's work is extensive in areas such as cosmology, physics, astronomy, climatology and geology. His work has taken him into studying ancient cosmic cataclysmic cycles, Galactic Core Explosions, Black Holes, Gamma Ray Bursts, Subquantum Kinetics and the decoding of the Sphinx Stargate zodiac cryptogram. The globalist war drum keeps beating. Since the faux peoples revolution could not topple the crazed Libyan dictator, the U.N. voted to institute a no fly zone. That report was immediately updated and the no fly zone turned into a British and French bombing campaign which is scheduled to start on Friday (3-18-2011). While the world is focused on the meltdown in Japan the elites are continuing their plan of mid-east destabilization which will eventually turn into a showdown with Iran. Alex Jones & Mike Adams: "It's All About Keeping You Dependent"
The map reports a "survey" of the area is currently "underway," in other words the Japanese government is not reporting the obvious fact the area is contaminated with deadly radiation and it does not want the Japanese people or anybody else to know the full story. Normally stoic Japanese citizens are outraged over the lack of information forthcoming from the government. "Residents who have been evacuated after a radiation leak from a quake-hit nuclear power plant have expressed their anger with the lack of information about the incident and how to respond to it," The Mainichi Daily News reports. In Russia's Far East, residents on Wednesday stocked up on iodine and checked radiation levels. Russia's emergencies ministry toted the same line as other government's around the world -- there is no risk to human health and no danger from radiation is expected. Japan is struggling to control the reactors damaged by the disasterous earthquake as radiation levels continue to rise and a partial meltdown of nuclear fuel is feared in two facilities at the Fukushima plant. Workers were withdrawn after the danger of exposure peaked - the alert also saw plans to drop water from helicopters, adandoned. This week Max Keiser and co-host, Stacy Herbert, report on 30 billion black holes, food price riots and toppling the tyrants in the UK. In the second half of the show, Max talks to Richard Heinberg of the Post Carbon Institute about the Goldilocks Syndrome and the market response to resource scarcity. It's feared nuclear fuel rods may have partially melted at the 2nd reactor of the stricken Fukushima power plant. This comes after reports they were fully exposed for a short period of time. Shaun Burnie, an independent atomic energy consultant from Scotland says Japan's nuclear crisis is much worse than it seems. 1,898 people have been confirmed dead, and 15,000 are missing after Friday's devastating quake-tsunami in Japan. In the Miyagi province alone, authorities placed the death toll estimate from the earthquake-triggered tsunami at more than 10,000. It comes as second blast has rocked Fukushima nuclear plant. 11 people were injured in the explosion. The reactors are said to be intact at the moment. And officials claim there hasn't been a change in the radiation levels since the latest incident took place. Video by Chuck Olsen Following his appearance as part of an all-star progressive lineup at the Barrymore Theatre in Madison tonight, Ohio Congressman Dennis Kucinich (Dem.) spoke to The UpTake's Jacob Wheeler about the resurgent labor movement in Wisconsin and elsewhere, and how it has slumbered in the past 17 years since the North American Free Trade Agreement was signed in 1994. Kucinich lamented what little the Democratic Party has done to support organized labor, and chastised President Obama for not being here to lead the movement. Kucinich expressed worry that his home state of Ohio  which just passed similar union-busting legislation  will soon be "selling everything that's not nailed down". In light of the fact that a Democratic president in the White House has yet to set a timetable for ending the war in Afghanistan, Kucinich continues to press for a "Department of Peace" to replace the "Defense Department". New pictures are emerging of the moment the tsunami struck northeastern Japan. Rescue teams are searching for the missing along hundreds of kilometers of coast. They're combing through towns and villages that have been reduced to splinters. This special video interview for Prison Planet.tv subscribers features a discussion with Robert M. Bowman, a former Director of Advanced Space Programs Development for the U.S. Air Force in the Ford and Carter administrations, and a former United States Air Force Lieutenant Colonel with 101 combat missions. He holds a Ph.D. in Aeronautics and Nuclear Engineering from the California Institute of Technology. Bowman is a prominent critic of the Strategic Defense Initiative, aka "Star Wars," and has also been a vocal advocate for the 9/11 truth movement. Representative Dennis Kucinich, (D- Ohio) attacks Wisconsin Governor Scott Walker for his trashing of workers' rights. The Governor signed a bill that eliminated most collective bargaining rights for public employees. This "Speak Up For Workers' Rights" rally happened after a massive protest at Wisconsin's state capitol. How many people showed up for the March 12, 2011 workers' rights rally in Madison, Wisconsin? Estimates range all over the board, but it was a huge number. Look at the shot from this crane by The UpTake's Matt Johnson. There is a river of people all the way down State Street. After the devastating earthquake off the coast of north-east Japan damaged the cooling system of several reactors at Fukushima's nuclear power facility, a large explosion appears to have blown the external walls and roof off one of the reactor buildings. Al Jazeera's Sonia Gallego reports on what this means for the safety of the plant - and of the thousands of people who live nearby. America's Economic Tsunami Is Almost Here, Time Is Running Out! RT talks about the earthquake and it's effects to Dr. Robert Jacobs, a research associate professor of nuclear history and culture at Hiroshima Peace Institute. An explosion at a Japanese nuclear power station tore down the walls of one building on Saturday as smoke poured out and Japanese officials said they feared the reactor could melt down following the failure of its cooling system in Friday's powerful earthquake and tsunami. Countries across the Pacific area, including Russia, South America, the U.S. and Indonesia have been put on alert for any tsunamis heading their way. But while the first waves have now reached America's mainland any major threat appears to be fading. 95 deaths reported in Japan, but that is rising quickly. One Japanese news agency suggests there are literally tens of thousands unaccounted for. Worst hit is the north eastern city of Sendai. Police say almost every house there has been damaged or destroyed. This 8.9 earthquake was the strongest in Japan since records began 140 years ago, in fact its the 6th- largest ever recorded in the world. Experts say it's around eight thousand times bigger than the quake which devastated the New Zealand city of Christchurch last month. Joel Skousen: Joel Predicts The End of Saudi Arabia! Alex welcomes back to the show political scientist Joel Skousen, editor and publisher of World Affair Brief, a weekly news analysis service dedicated to providing an understanding of the hidden agendas behind the actions of world leaders and other powerful individuals who influence government from behind the scenes. Skousen has written several books, including Essential Principles for the Conservation of Liberty, and Strategic Relocation -- North American Guide to Safe Places. Alex also covers the latest news and takes your calls. Northern Japan has been swamped by a major tsunami - and the entire Pacific region is now on alert. It was caused by an 8.9-magnitude earthquake that struck 130 kilometres off the eastern coast - sending a 4-metre wall of water inland, causing widespread devastation. So far, 23 people are confirmed dead - but that number's expected to rise. The first wave has also reached Russia's Kuril islands to the north, reportedly around a metre high. In Japan, 200 people have reportedly been washed away, with several others missing on Japan's Sendai island. Tokyo's been all-but shut down - with fires and injuries widely reported there. Millions are without electricity. Norita International Airport has been shut down. Hawaii is now bracing for a destructive wave to reach its shores within the next few hours. This week Max Keiser and co-host, Stacy Herbert, report from Cairo about markets loving tyranny, a former prime-minister visiting dictators in the desert for JP Morgan and a Central Banker running over bicyclists. In the second half of the show, Max talks to investigative journalist, Lina Attallah, about the role of social media, women and youth in the Egyptian revolution. Ron Paul : Democrats & Republicans Are Afraid Of Being Called Soft On Defense! what the true purpose of this tax is. Corsi is best-known for his two New York Times bestselling books: The Obama Nation and Unfit for Command. He is also a journalist for the alternative news websites WorldNetDaily and Human Events. For The First Ever The FCC Enacts Their Governance On The Internet! Without Approval By Congress! No Western Govt Has Ever Claimed The Power To Do This! Not Hitler! Not Stalin! Dr. Nick Begich, author of Angels Don't Play This HAARP; Advances in Tesla Technology. He is also the author of Earth Rising - The Revolution: Toward a Thousand Years of Peace and his latest book is Earth Rising II - The Betrayal of Science, Society and the Soul. Lord Monckton: "Economic Savage Warfare"
British politician, journalist, and outspoken critic of the theory of anthropogenic climate change, Lord Christopher Monckton. Monckton believes Al Gore and the climate change fraudsters at the University of East Anglia should be criminal charged. Minneapolis, MN, The faithful "Free Bradley Manning," group met again in front of Senator Amy Klobuchar's Minneapolis office to request she join in the Dennis Kucinich inquiry into the conditions of Private Bradley Manning's confinement in the brig at Quantico, Virginia. Manning has dual British-US citizenship. He has been confined there since July 2010 after he was accused of leaking classified documents to WikiLeaks. ;He's allowed minimal contact with the outside world, and for 23 out of 24 hours every day he sits completely alone in his cell. Watch the full episode 127 of the Keiser Report on Tuesday. This week Max Keiser and co-host, Stacy Herbert, report from Cairo on war profiteers blaming foreign 'financial terrorists' for the economic collapse that they helped cause. The also talk about Gaddafi's billions and China's gold. Obama budget is the continuation of the bailout plan which was carved out to please corporate companies. They now have to balance the budget on the side of the poor. So, interest rates will go up and bank portfolios will collapse. Indeed the war machine in the states is very powerful and they are controlling the entire system for implementing their objectives. Corbett Report and Media Monarchy that covers some of the most important developments in alternative news and open source intelligence. There is no reason for continued taxation, the government has a secret slush fund and in the meantime is telling you that they're broke. Joel Skousen, editor of World Affairs Brief, was the chairman of the Conservative National Committee in the 1980's. In this exclusive video interview for Prison Planet.tv members, Skousen talks about the hidden power structure that controls politicians of both parties from behind the scenes, the nature of the manipulated press, the reality behind the tea party, and the ongoing conspiracy to create a one world dictatorship. Skousen explains that there is "systematic evil" in the world which uses certain techniques to proliferate, including the dialectic of crisis creation in order to induce good people into accepting or doing things that they wouldn't ordinarily do by way of deception, which is why evil uses crisis creation to change the world. Skousen discusses how his famous uncle, Cleon Skousen, discovered how the fall of China to Chairman Mao was aided by the US State Department by withdrawing support for Chiang Kai-shek, which led to a realization that there were globalists within the US government who had no allegiance to America, particularly Alger Hiss, the writer of the UN Charter, who had joined the Communist Party to facilitate Communist infiltration into the State Department - using communism to facilitate the goals of globalism. Alex talks with film-maker, broadcaster and former broker and options trader Max Keiser. Keiser is the host of On the Edge, a program of news and analysis hosted by Press TV and also hosts Keiser Report, a financial tabloid, that broadcasts on RT. Keiser correctly predicted the 2008 collapse of Fannie Mae and Freddie Mac, that sub-prime mortgage-backed securities would be the cause of recession by 2008, and the break-down of Iceland's economy in 2008. Alex also covers the latest news and takes your calls. Ex MLB Player Lenny Dykstra: 'Predatory lending' How to Stop The Banks from Stealing Your Home! I'm Lenny Dykstra - in 1986 when I was a rookie playing for the New York Mets, I was fortunate to be a member of the World Series Championship team. In 1993, I played in my second World Series and over my professional baseball career, I set several baseball records and was voted an All Star three times. 9/11 Truth • Richard Gage, AIA, debates journalist Rev. Chris Mohr. This time Max Keiser and co-host, Stacy Herbert, report from Beirut on oil prices, a sectarian regime, the geo-politics of Saudi oil and the Benghazi dance. In the second half of the show, Max talks to two time Pulitzer prize winner, Anthony Shadid of the New York Times, about the revolutions sweeping the Arab world.